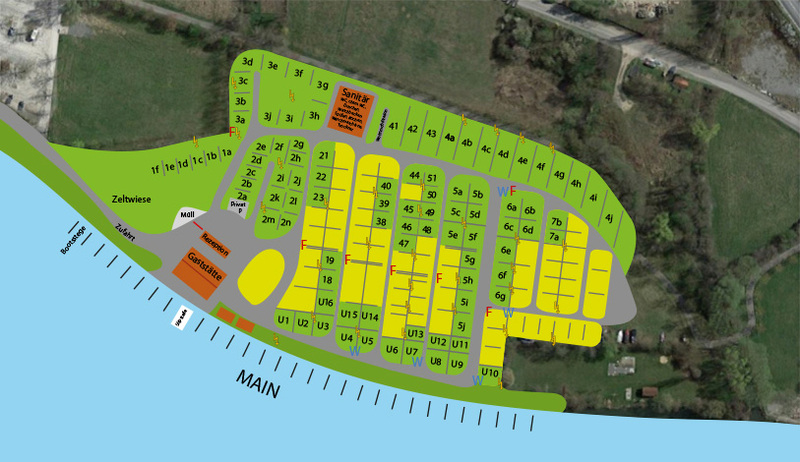 Well maintained grounds with generously laid out, parceled campsites (80-140 m²) and electricity (16A). All campsites are equipped with electricity and are located on a sparse lawn with mature trees. Some campers can enjoy sites with direct views of the water. Boat friends can launch canoes, kayaks and motor boats in the water using our own slipway and sail directly from the campgrounds onto the Main. A private marina is also available. We also place great importance on cleanliness in our heated sanitary building. 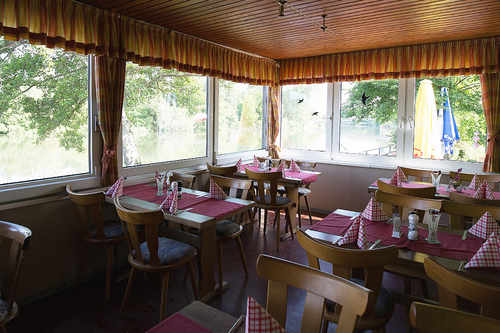 We provide for the the physical well-being of our guests with a cozy pub with a beer garden and direct views of the Main River. > Arrival until 22:00 possible with camera-registration number-system pre-booking necessary). > Central location to the city (approx. 15 minutes walk), immediate proximity to the shopping center (300 m), right next to the outdoor swimming pool, indoor saltwater pool and the Aqua Sole sauna world. > Sale of propane gas and camping sanitary items. > Discounted admission to the open-air swimming pool, indoor swimming pool and Aqua Sole sauna world and from two nights daily free entrance to the indoor pool (2h per day / person). > Sale of tourist maps, provision of brochure material. > Payment with EC-card possible.